Norman Rockwell - - - "Vice President Spiro Agnew"
This oil on board painting was created by Norman Rockwell for the May 16, 1970 cover of TV Guide. 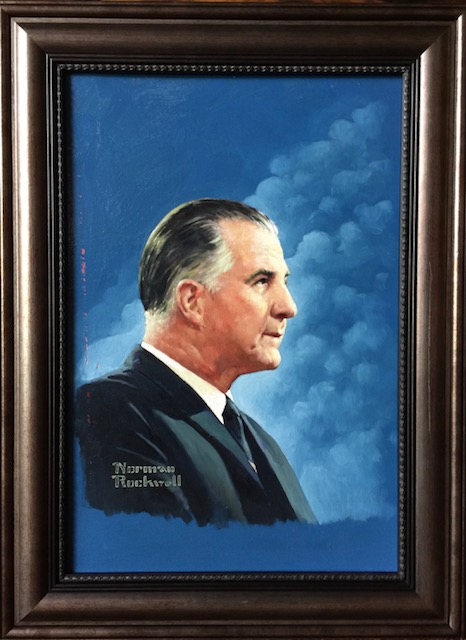 This image of Vice President Spiro Agnew is one of several political figures that Rockwell painted during this era. Norman Rockwell was born on February 3, 1894 in New York City. By age 14, he enrolled in classes at The New York School of Art. At 16, he dropped out of high school and entered The National Academy of Design, and went on to study at the Art Student's League. Upon his graduation, he took on the job as art director for Boys' Life magazine. In 1916, while newly married to his first wife Irene O'Connor, he created his first illustration painting to be used on the cover of The Saturday Evening Post. He would create iconic covers for the magazine for the next 47 years. In 1920, he painted a calendar illustration for the Boy Scouts of America. He would continue to paint illustrations for the Boy Scouts throughout his lifetime. Rockwell thrived as he created illustrations of everyday life in small town America. His paintings always told a story or made a statement about what was going on in the country at the time. He created Post cover illustrations depicting great moments in history, such as the 1927 Post issue celebrating Charles Lindbergh's crossing of the Atlantic, as well as the 1969 moon landing, created for the cover of LOOK magazine. In 1930, Rockwell married a school teacher, Mary Barstow. In 1939, Rockwell, his wife and 3 sons relocated to Vermont. In 1943, Rockwell created a series, known as the Four Freedoms. Freedom of Speech, Freedom of Worship, Freedom From Want and Freedom From Fear, appeared as covers on the The Saturday Evening Post, and were proven to become some of his most most popular and iconic works. He created illustrations for many magazines, including Country Gentleman, Literary Digest, Life, and LOOK, but is widely known for his Saturday Evening Post cover illustrations. In 1953, Rockwell moved to Stockbridge, MA, where he spent the rest of his life. In 1961, following his wife's death, Rockwell married for third time to Molly Punderson, a retired teacher. During his later years, Rockwell focused much of his work on the many social issues of the era, such as the Vietnam war, civil rights, and poverty. In order to preserve his legacy, during the 10 years prior to his death, Rockwell created a trust. His studio, as well as his works would become the focal point of what is now the Norman Rockwell Museum, located in Stockbridge, MA, where he spent the final 25 years of his life. Norman Rockwell passed away on November 8, 1978.